Beyonce Knowles and Jay-Z attended the 2019 Roc Nation THE BRUNCH event on Saturday (February 9) in Los Angeles, California. The couple graced the event like the King and Queen of Zamunda. He was looking very dapper in a light blue Frère suit, while she was rocking the first piece from Olivier Rousteing’s Balmain Spring 2019 Haute Couture collection. This collection wasn’t so well received, but I don’t see that deterring celebrities from it. While some of the pieces seemed over-the-top, at the heart of each piece they are oozing the elegance of la France. I love the smoothness of the sculptural detail. Exaggerated, yet refined and stylish. 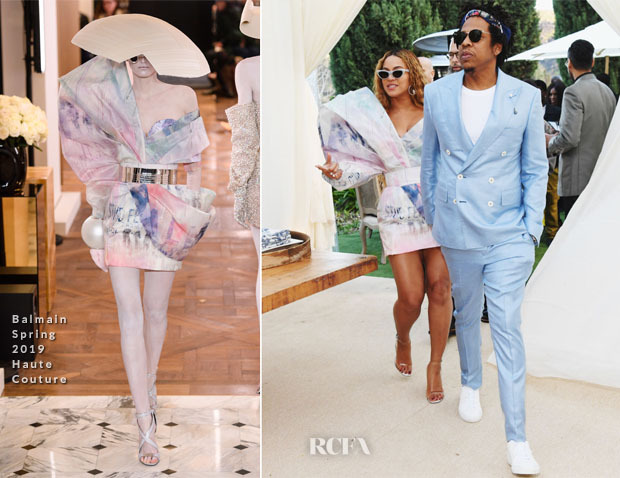 Beyonce’s look feels fresh and light and alongside Jay-Z’s suit, they presented a very summery outlook. The couple are nominated for three Grammys this year, including Best Music Video for ‘Apes**t,’ Best R&B Performance for ‘Summer’ and Best Urban Contemporary Album for ‘Everything Is Love’.